Speaking Sunday at the UN’s conference of donors to the Palestinian Authority, Deputy Foreign Minister Daniel Ayalon warned that while Israel supports economic assistance to the PA now, that is liable to change within the week. Ayalon’s position is eminently reasonable. Unfortunately, it contradicts utterly the official position of the Government of Israel. Israel’s move was reportedly championed by the Defense Ministry and the IDF senior brass, which reportedly adamantly opposes cutting off any aid to the PA, including aid to the US-trained and financed Palestinian army in Judea and Samaria. As The Jerusalem Post reported on Sunday, senior Defense Ministry officials argue that an aid cutoff is liable to lead to the PA’s collapse and PA employees – which comprise the majority of Palestinian workers – may become violent. In other words, the Defense Ministry argues that if the donor countries stop paying off the Palestinian militias – including the US-trained and funded Palestinian army – then their supposedly moderate forces will turn to the terror business to support themselves. Aside from being strategically insane, this position bespeaks an unjustifiable unwillingness on the part of the leftist-dominated Defense Ministry to understand the basic nature of the Palestinian cause and what it requires from Israel. Since the IDF and the Foreign Ministry and the rest of the government bureaucracy embraced the PLO as Israel’s “peace partner” 18 years ago, they have been operating on the assumption that the PLO and its spinoffs – Fatah and the PA – are interested in reaching a peace deal with Israel. But this has never been the case. For the PLO and its spinoffs, the Palestinian conflict has always been and will always be a zero sum game. The goal of the Oslo process, the goal of the PA, of the Palestinian militias, and of the UN bid is one: to strengthen the Palestinians and weaken Israel. We know this is the case because this is what the Palestinians – led by the PLO/Fatah/PA – did in Gaza after Israel unilaterally surrendered. The last military vehicle had barely cleared the border when the Palestinians torched the synagogues Israel had left standing. So too, after Ehud Barak essentially offered the Palestinians Israel’s head on a platter when he offered them the Temple Mount, they pocketed his offer and began butchering Israelis in a bid to “liberate” the Temple Mount. The much vaunted Palestinian security forces organized, funded and directed the terror war. And the internationally financed PA budget paid for it. The reason that the Palestinians are turning to the UN is not because they cannot receive statehood in the framework of a peace deal with Israel. They are going to the UN because they don’t want a peace deal with Israel. They want sovereignty and they want to remain at war with Israel. For 18 years the IDF’s top brass has refused to recognize the game that the PLO has been playing since the onset of the fake peace process. Informed by the leftist establishment, the IDF’s senior officers vacuously argue that Israel’s only option is to strengthen the PA, including its US-trained and funded army. This appeasement mindset has paralyzed the IDF’s ability to develop comprehensive strategies for victory for nearly a generation. And the IDF’s leadership clings to appeasement despite the fact that the public has completely rejected it due to its consistent failure. The basic rule of commonsense policy-making is to be good to your friends and bad to your enemies because then people will want to be your friends and they will not want to be your enemies. The appeasement mindset turns this rule on its head. As far as the appeasers are concerned, you must be good to your enemies and bad to your friends because your enemies will stop hating you if you’re nice to them. As for your friends, they are wrong to be your friends since you have yet to be worthy of friendship since you have not yet appeased your enemies. By supporting continued foreign aid to the Palestinians in the aftermath of their UN bid the government has adopted a classic appeasement policy. It has told the Palestinians that they will pay no price for their act of aggression. Worse, Israel just told them they will be rewarded. Israel has gone on record saying it cannot manage without the Palestinian governing body that exists to destroy it. As for Israel’s friends, the government just pulled the rug out from under their feet. Cong. Ileana Ros-Lehtinen, the chairman of the House Foreign Affairs Committee, is a true friend of Israel. Her bill calling for a cutoff of US aid to the PA and a massive decrease of US aid to the UN in the event the UN upgrades the Palestinians’ diplomatic status is one of the most important pieces of pro-Israel legislation to be introduced in the US Congress in a generation. By announcing it opposes an aid cutoff, Israel undermined Ros-Lehtinen’s position. It betrayed its good friend. No doubt Prime Minister Binyamin Netanyahu and Foreign Minister Avigdor Liberman were under great pressure from the IDF and from the Obama administration to call for continued international funding of the PA. But the public didn’t elect them with the expectation that they would abandon Israel’s national interest and harm its friends just because they feel the heat. 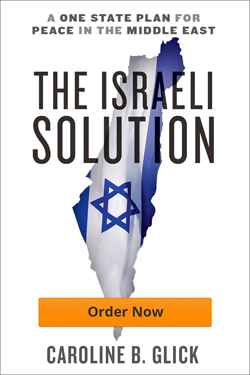 The appeasers claim that Israel wins international approval by being good to its enemies. But 18 years of consistently attacking its friends and praising its foes has brought Israel to the brink of international isolation. We have empowered our foes and demoralized our friends. And now we continue to squander what little diplomatic influence we still have left in a bid to again aid the Palestinians in their continued war against us. ountry, it should think again. The only way to fix what just happened is for the government to issue a new policy supporting the cutting off of foreign aid to the Palestinians and announcing that Israel will stop transferring tax revenues to them if their status at the UN is upgraded in any way. And Netanyahu should pick up the phone and personally apologize to Ros-Lehtinen for his government’s disgraceful behavior.